Jennifer Lewis, 52, is on a mission to change the way the National Health Service (NHS) provides follow-up care in Scotland. In particular, Lewis wants the NHS to provide abdominal MRI scans rather than ultrasounds for Scottish ocular melanoma patients. The main impetus for Lewis's crusade was her diagnosis of ocular melanoma in 2013. For those who don't know, ocular melanoma is a form of eye cancer that has serious risks for metastasis. Lewis first found out she had this rare eye disease after a routine vision test at Gartnavel Hospital in Glasgow. Luckily for Lewis, her optician caught this cancerous disease in time to successfully operate on it. When left untreated, ocular melanoma has a tendency to metastasize from the patient's eye into the liver. At the moment, Scots only have access to abdominal ultrasound scans through NHS to detect liver metastasis. 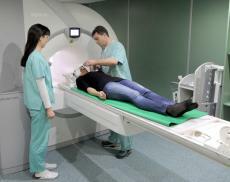 Residents of England, however, can use more effective MRI scans for the same issue. In an attempt to change this, Lewis wrote up a petition which she presented in Holyrood, Edinburgh. Her petition called on all Members of the Scottish Parliament (MSPs) to persuade government officials to allow MRI scans for ocular melanoma patients in Scottish NHS hospitals. When Lewis addressed the Scottish Public Petitions Committee, she told MSPs all about her close call with ocular melanoma and the current state of affairs with NHS scanning in Scotland. Lewis argued that these ultrasound scans are not as effective as MRI scans for detecting cancer cells on the liver. Lewis's campaign has received support from the charity group OcuMel UK. One member of OcuMel UK, Iain Galloway, told MSPs that having an MRI scan in England saved his life. Mr. Galloway had already lost one eye due to ocular melanoma, but the follow-up MRI scan revealed that the disease metastasized into his liver. Thankfully, Mr. Galloway's cancer was completely removed in a 2013 surgical procedure. About 50 percent of people with ocular melanoma get metastases of the liver. The best way to see whether or not a patient's liver has cancer cells or not is to get an MRI scan. Mr. Galloway told MSPs that everyone he knows that has successfully recovered from liver metastases has always had an MRI scan first. Ultrasounds of the abdomen simply can't pick up on the cancer cells as quickly as an MRI. Some doctors claim ultrasounds can only pick up tumors on the liver after they've grown into the dozens. Both Lewis and Galloway said MSPs seem very interested in this issue and are committed to helping change NHS policies in Scotland. The MSPs involved in this hearing said they would open an investigation into this issue and talk it over in more detail with the Scottish Government. Ocular melanoma currently affects seven in every one million people. Although it is rare, this disease can be life threatening for those who have it, especially if it metastasizes to the liver. While Lewis is healthy right now, she will have to go for surveillance scans for the rest of her life.